LOS ANGELES, Dec. 15, 2017 /PRNewswire/ -- Economic growth across the Asia-Pacific region will continue in 2018 but will moderate in more developed Asia-Pacific countries, Bank of the West Chief Economist Scott Anderson said at the 23rd Annual Pacific Rim Client Appreciation Dinner. Emphasizing its decades-long commitment to the Pacific Rim market, Bank of the West held its annual Pacific Rim Client Appreciation dinner last night in Pasadena, CA for more than 400 Pacific Rim clients. Attendees – many of whom are Asian immigrant and Asian-American entrepreneurs -- heard from international corporate executives on the challenges and opportunities in cross-border operations and the modern international customer experience, along with Anderson's outlook. 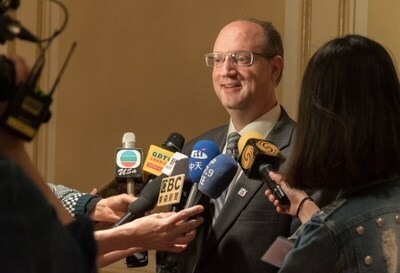 "Global growth is going to continue in a largely synchronized way," said Anderson. "Asia, particularly the developing Asia markets, will continue to grow above the global trend, while we expect some slower but still healthy growth in China and Japan in 2018." Anderson expects the U.S. Federal Reserve will raise interest rates two more times throughout 2018, with job growth pushing the U.S. unemployment rate even lower next year. He also projects domestic Chinese credit growth will downshift in 2018 after a year of rapid expansion, while Japanese unemployment remains at its lowest level in decades. For more of Anderson's economic analysis, follow him on LinkedIn for weekly updates. Anderson along with Yukinori Nishio, Executive Vice President and Head of the Bank's Pacific Rim Banking Division, and Michelle Di Gangi, EVP and Head of Small and Medium Enterprise Banking, also participated in a press event prior to the annual dinner. Nishio, at both the dinner and press briefing, discussed the importance of a dedicated Pacific Rim business in relation to its Asian communities and business associates. 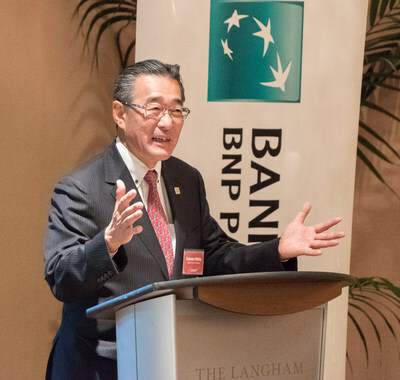 "Bank of the West remains committed to being the local bank that can meet the global needs of our Asian and Asian-American clients," said Nishio. "We continue to be honored by the trust they place in Bank of the West to help meet the challenges they face and opportunities they see in this evolving world." Through Bank of the West's Pacific Rim Banking Division, individuals and businesses are offered a full range of business, corporate, personal and international banking services by 180 specialized relationship managers who focus on servicing clients from the Pacific Rim. Through a representative banking office in Chicago and corporate banking offices in San Francisco, San Jose, Los Angeles, and Portland, the Bank's clients, who may have operations in the United States and Asia, can access credit and deposit services – including cash management, foreign exchange, trade finance and other banking services. To serve a growing number of U.S. subsidiaries of Asian‐based companies, Bank of the West operates representative offices in Tokyo and Taipei. In tandem with the Network Business Development Desk of BNP Paribas China which has branches in Shanghai, Beijing, Tianjin, Guangzhou and a representative in Chengdu – Bank of the West can personally respond to clients in both the East and the West. Bank of the West is a financial services company headquartered in San Francisco with $89.8 billion in assets as of September 30, 2017. Founded in 1874, Bank of the West provides a wide range of personal, commercial, wealth management and international banking services through more than 600 branches and offices in 23 states and digital channels. Bank of the West is a subsidiary of BNP Paribas, a leading bank in Europe, which has a presence in 74 countries with more than 192,000 employees. To learn more about Bank of the West, visit About Us via BankoftheWest.com.